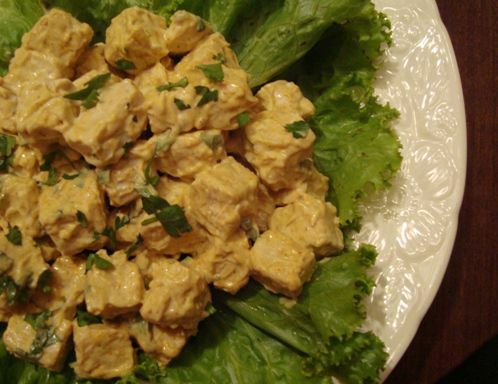 A vegetarian "chicken" salad recipe made with tempeh as a vegetarian and vegan chicken substitute. Make it vegan by using an egg-free and dairy-free vegan mayonnaise instead of regular mayonnaise; all of the other ingredients are completely vegan. Another option? To turn this tempeh salad into a simple curried tempeh chicken salad, add in a handful of raisins and slivered almonds and increase the amount of curry, perhaps adding a bit more salt as well. Just like a regular chicken salad recipe, this vegetarian tempeh chicken salad recipe is one of those recipes that will do best made ahead of time, so it has plenty of time to chill in the refrigerator, allowing the tempeh to soak up all the flavors. Bring a few inches of water to a boil in a pot or large skillet. Add the cut tempeh. Simmer for 15 minutes. Drain completely. NOTE: Tempeh must be cooked first -- it can't be used raw, even though it will eventually be served chilled. Heat two tablespoons olive oil over medium heat. Add tempeh and fry for about 5 minutes, stirring frequently to cook on all sides. Remove the pan from heat and allow to cool. In a large bowl, combine the cooled tempeh with mayonnaise or vegan mayonnaise, lemon juice, onion, celery, dried parsley, curry powder, and cayenne pepper. Stir to combine well, making sure that the mayonnaise mixture evenly coats the tempeh. Season lightly with salt and pepper. Taste, and adjust seasonings or add a bit more salt and pepper to taste, if you'd like. Enjoy your tempeh chicken salad on a bed of lettuce, between two lightly toasted pieces of bread or stuffed into a pita bread for a pocket pita sandwich.